Church Weddings ~ Hymn and music choice. With civil ceremony's being lisenced for all sorts of venues, the "church wedding" numbers have reduced. Some couples still opt for a church ceremony even though they may not be regular church attenders. 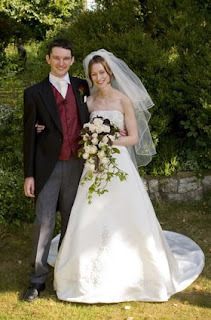 In many cases they will be required to attend Pre -wedding courses run by the minister, vicar or priest. Regular church attendance may also be a requirement for being married in the church. Choosing music and readings for those services can be awkward. 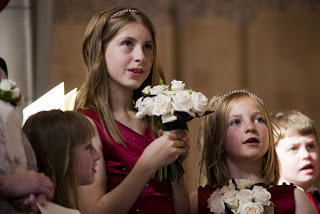 Singing songs of praise to God is very much part of the Christian wedding ceremony and at very least two hymns or modern worship songs will be required. A church wedding where only a couple of people including the vicar join in the singing can be acutely awkward and leave the bride and groom squirming in full view of everyone. One way to avoid this is to choose hymns with well known tunes. Examples of this are: the tune: land of hope and glory tune with the words "Glory in the highest", or the tune I vow to thee my country with the words "o God beyond all praising" These examples are really rousing tunes that people will readily join in with. Wedding Reading ~ from "The Prophet"
Catering for Weddings can add immence costs to the wedding and is probably your greatest expence altogether. At a typical hotel you will be looking at costs of at the very least £22 per head. This will also be subject to other costs for drinks, corkage, napkin hire etc. There may also be the problem of limitations as far as supplying your own drinks, chocolate fountains etc as the hotels like to use their own supplies etc. One way of cutting down on this expense is to self cater. If you are lucky enough to find a local hall that will accomodate your guest numbers then you have several options. you can hire a team of caterers to provide a buffet or you can go to sainsburies, marks and Spencer or other local supermarkets and purchase their buffet catering platters. Many halls have crockery available to hire. The pictures illustrating this article are from the Sainsburys range of Deli platter catering. These platters come set out with garnishes and are incredibly impressive. There are a full range of vegetarian/ standard food ideas including world snacks, sushi, passtries, meats, salads and sandwiches. They will look great set out on a buffet table. Sainsburys also have a free glass hire service at many of their stores, which will go someway to providing all you need. You can then source your drinks from wherever you want and you could even use boxes of wine which can then be used to fill caraf's for the tables. 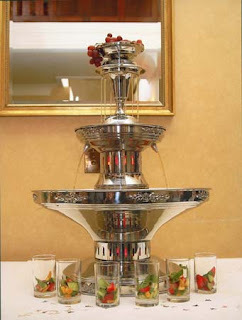 This example of a pims fountain (above) is from Michele of Tempting Propositions. and shows a great example of money saving. Rather then the real "Pimms" (alcholic beverage served with fruit and lemonade as a summer drink) which retails at approx £13.00 per bottle. michele purchased the Aldi version called "Austins" which retails at under £5.00 per bottle. this allows you to serve the sophistication with out the sophisticated cost! Here we can see Michele and her husband cutting their "cake" which rther than the traditional wedding cake, they chose to have a cheese cake which was created for them by a friend. The cheese cakes were displayed as a wedding cake and then served out as the desert. (there were another three behind the scenes so there was plenty for everyone. I'm sure there are many more Crunch busting tips for wedding catering and I'll share those with you as I discover them. Following on from the previous post (below) where we featured cakes made and decorated by family and friends, this post is dedicated to another method of saving money with wedding cakes. 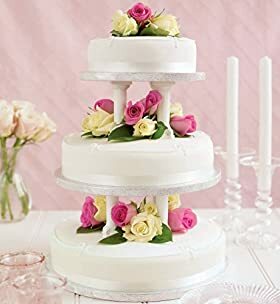 The cake above is one of Asda's range of cakes ready iced in simple white smooth icing, designed to be assembled as a wedding cake and decorated by you. Asda's cakes are fruit cake and come in three sizes: Large, medium and small. They offer more choice and options. You can select white or ivory icing. The examples above and below are Jac's cakes decorated and assembled by herself, using M&S cakes. 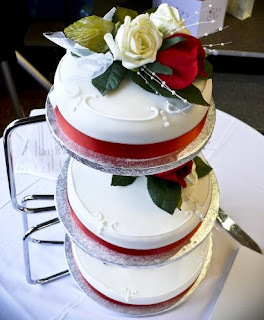 coloured ribbons, flowers, ornaments etc can be added to personalise the cakes giving you a unique and amazing cake to be proud of. 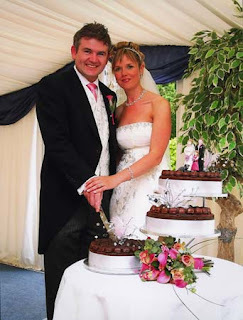 The cost of wedding cakes is another huge expense to add to the cost of the wedding. Prices range from a couple of hundred up to several hundred depending on the style, number of tiers etc required. One way to save money with the cake is to ask talented friends or family members to create the cake for you. This stunning cake was created for the wedding of David and Katherine of Wedding Chaos fame. 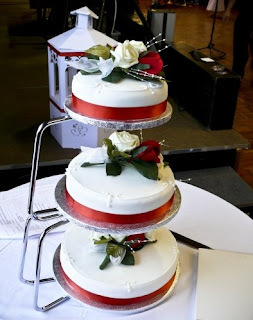 David's mother made the cake and his auntie decorated it making it a really special feature of their wedding. "Whilst it obviously saved money, that was not the reason - it just didn't make sense to go elsewhere when we could get exactly what we wanted from Mum and Aunty." The Crunch ~ Wedding Transport. With the credit crunch looming over us all. Many people are looking for ways to cut down on expenses. 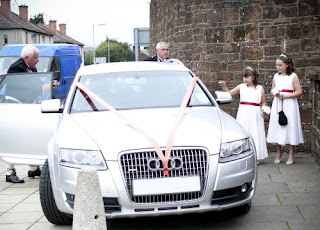 On way is to ask a friend or family member to provide transport for you to the wedding. The photo above is one example of this. A relatives car is used as transport. Ribbons are attached and it is very difficult to tell any difference from a professional outfit. The ribbons are available from Tie the Knot Balloons for a very reasonable cost. Any car could be used. Choose to match colour, traditional looking car, vintage or retro. This is a great way to involve someone you want to give a special role to. Phot from Philippa and Matt Waller. This stunning tiara can be created in either Gold or silver metal. Above is Gold and the bride below is wearing the silver version. The Swarovski Crystals are AB finished and therefore have an "extra" sparkle about them. Snow flake Cake ~ Royal icing nowglakes and edible glitter dust complete this stunning artwork! "Angel Cake" ~ cake carved into a cone shape and covered in rice paper 'feathers'. feathers around the board and cake dotted with diamantes. Hat pins have been around for many many years. Initially they were formed from bone and not just used for head wear, but also as garment closures. 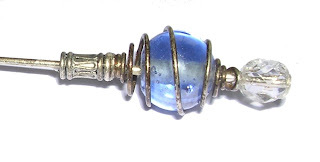 As man became more able to use other materials, the hat pin became metal. Beads, feathers and stones were selected to adorn them and they became a feature item used to enhance the hat. 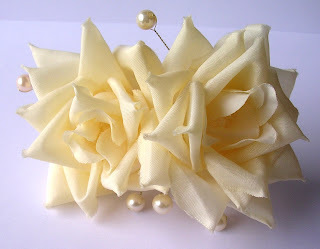 In recent times, hat pins have been seen as old fashioned and unnecessary, but just recently, they are making a come back and now adorn many a wedding hat. 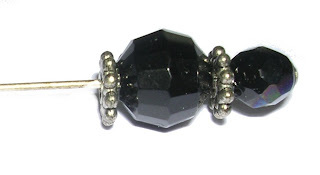 At Crystal Velvet, we are able to create hat pins to match any outfit using beads, crystals etc. Contact us through Crystal Velvet to have your hat pin created to match your outfit and accessories. I love this natural setting with beautiful lighting. 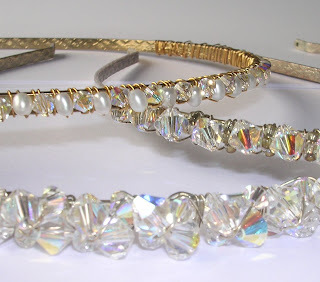 These photo shows an example of the way the Tiara bands are encrusted and endorned at Crystal Velvet. Great crae is taken with the finished product and embellishments are chosen with great care so that they enhance the product. 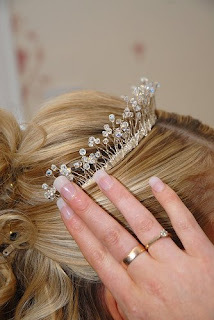 The banding can be done as an alice band style tiara or around the base of a fronded tiara. Arch fronted tiara formed with Gold plated wire, hematite and pearls. 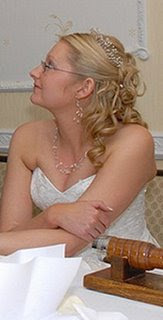 This is a fairly dense fronted tiara and will particually suit those brides / bridesmaids with piled up dark hair. 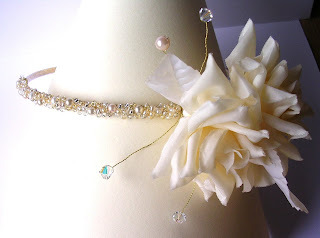 This is a one off tiara with a very free style approach. amethyst is set off with with matt finished glass beads and pearls in very sea inspired tones. Can be worn either way up with the rock quartz chips at the top or the botto. I recently decided to extend my range of head wear to include floral offerings. 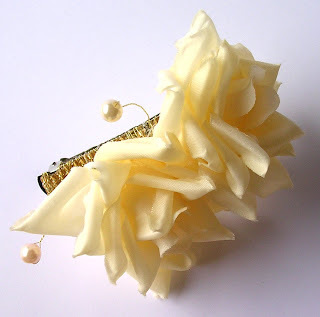 These stunning soft touch roses are placed on a bead encrusted barrette clip. The picture has made the roses look far more yellowy toned than the actual ivory that they are. Pearl and crystal picks accent the flowers. The same style can be created using other colours and styles of flowers. I then went on to develop the idea further and have created the tiara with the roses and an intricately encrusted band with delica beads and small pearls. 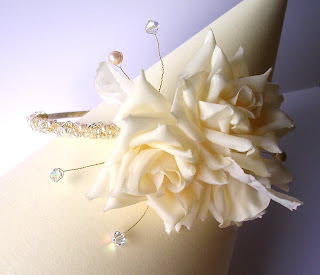 Again, this basic style of flower tiara can be created in any flower / colour to suit your scheme. These tiaras can also be developed into more of a fascinater. available through Crystal velvet. or email in the profile.